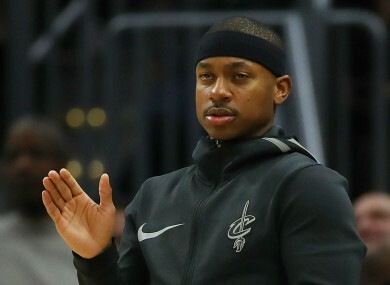 The Cleveland Cavaliers welcomed Isaiah Thomas into their lineup in the NBA. Cleveland Cavaliers guard Isaiah Thomas played his first game with his new side. ISAIAH THOMAS MADE his Cleveland Cavaliers debut on Tuesday with an impressive performance in the NBA. Making his Cavs debut after missing more than two months with a hip injury, Thomas came off the bench to score 17 points with three assists in just 19 minutes in a 127-110 win over the Portland Trail Blazers. LeBron James led the Cavs’ scoring attack with 24 points, eight assists and six rebounds. Six Cavs reached double figures Tuesday, including Kevin Love’s 19 points and seven rebounds. Cleveland outscored the Trail Blazers 31-13 in nine minutes with Thomas on the court and James on the bench. That sort of dynamic will give coach Tyronn Lue plenty of flexibility with lineups. The Cavs once again have two elite offensive weapons that can carry the scoring for bursts. On the other side, Damian Lillard returned for the Blazers after a five-game absence due to a hamstring injury to score a game-high 25 points with six assists. Portland have now lost two of their last three games, but remain in the playoff picture in the West. Elsewhere, Spurs star Kawhi Leonard scored a season-high 25 points in 31 minutes, leading San Antonio to a 100-91 win over the Knicks. Leonard also had eight rebounds, four assists and four steals, proving he is nearly back to All-Star form. The Suns’ search for a point guard since Eric Bledsoe’s departure has not been going well, and Tyler Ulis proved Tuesday in a 104-103 win over the Hawks that he is not the answer. Ulis scored just four points in 24 minutes with five assists and three turnovers. The Suns are young, and Devin Booker is an elite scorer, but they need a leader to run their offence to consistently contend. Email “No doubting Thomas as former Celtics star shines in his Cleveland debut”. Feedback on “No doubting Thomas as former Celtics star shines in his Cleveland debut”.